Part III in our series on Timesheets. See our previous article, “How to Get Accurate Timesheets,” also by Elizabeth Harrin. The Dreaded Timesheet. Few things inspire such feelings of loathing and outright groans of frustration by teams. People hate to love ’em and love to hate ’em. Familiar complaints? They’re outmoded, top-down, authoritarian and micromanage-y. Sound about right? Well, I hate to dispel the comfortable myths, but there’s more to modern time-tracking than meets the eye. We’re not talking the punch cards used by your ancestors. Modern time tracking is slick and beautiful, useful and streamlined. Online, intuitive timesheets take moments to update and give you such a rich stream of data that you’ll wonder how you managed to get by without them. Yet myths persist and it’s easy for people to hate them. So let’s bust up the myths so you can judge for yourself and, hopefully, come to love the tool that can ultimately save you time. Time tracking is so dated! When top-down management was in style then I can see why timesheets might have value. But they aren’t relevant to today’s collaborative work culture. Actually… Collaborative teams have just as much reason to track their time as dated command and control management environments. Everyone contributes their time when you work together on tasks. If they all record their time then you can roll up the results and see exactly how much the task took overall. You don’t have to rely on one person doing the work or guessing at how much effort the team put into it because, well, you know. Take that, out-of-date management philosophies! Time tracking can feel at odds with the modern workplace because if you are asking people to record their activity in 15-minute chunks, well, isn’t that micro-management of the worst kind? Micro-management is when you constantly ask for status update, hover over their shoulder and direct the work at a level so granular that it’s off-putting for most knowledge workers. Some people do thrive with that level of direction, but on a project it’s normally unnecessary if you have a team that you trust. In project work you’ll meet very few people today who appreciate their manager calling them to check the latest status of a task or to chip in about how it should be done. Micro-management isn’t effective on projects because it’s time consuming for the project manager, as well as being annoying for the team member. But it has nothing to do with time tracking. Time tracking still gives your team member the authority and autonomy to do their work in the way that they feel is best. They can structure their day and manage their tasks in any order, as long as they hit the deadlines they have agreed with you. All they have to do is record what they’ve done (again, at a time that’s convenient). Normally that’s as easy as picking off the tasks from the schedule and adding in their hours. No management oversight required at all – it’s only reporting. Timesheets are bureaucratic and difficult to set up. It takes too long to create a timesheet listing all my tasks. Then I have the overhead of having to fill them all in. This isn’t the 1980s! Your recollection of what time tracking was like back then, or what you’ve heard from other people if you weren’t working back then, is nothing like what modern time management systems can do. Enterprise-grade time tracking systems are easy to set up. They integrate with your project management tools and automatically pull tasks through to the timesheet, allocating them to the right people. All you then have to do is open the screen, click to record the number of hours and hit Save. Done in a matter of minutes. In fact, they actually will save you time in the long run. When you have up-to-date timesheets, your dashboard (in ProjectManager.com, for example) is automatically updated, so you know your project status in real time. The time you save in hounding team members to generate reports (or generating them yourself to manually populate a dashboard) is truly significant. If you make it a habit to record your time at the end of every day then you stay on top of it, and it’s a quick job to handle every time. If you’re spending more than 5 minutes a day on it then you’re doing it wrong. This one is definitely a myth. Because certain companies just don’t do timesheets? Actually, thousands of creative, innovative firms that make money from knowledge work manage to track their time. They have to, because they charge people for that creative thinking. If they didn’t know how much their time cost them, they couldn’t work out how much to charge or whether they were making a profit. Time tracking keeps them in business. Or perhaps you think that timesheets aren’t relevant to your industry because it’s a traditional vertical? Oil and gas, construction, energy firms…they all track time. When margins are low, knowing how much time your team is spending on different activities helps you make process improvements. Shaving even a few minutes of a regular process can mean the difference between hitting targets or not. 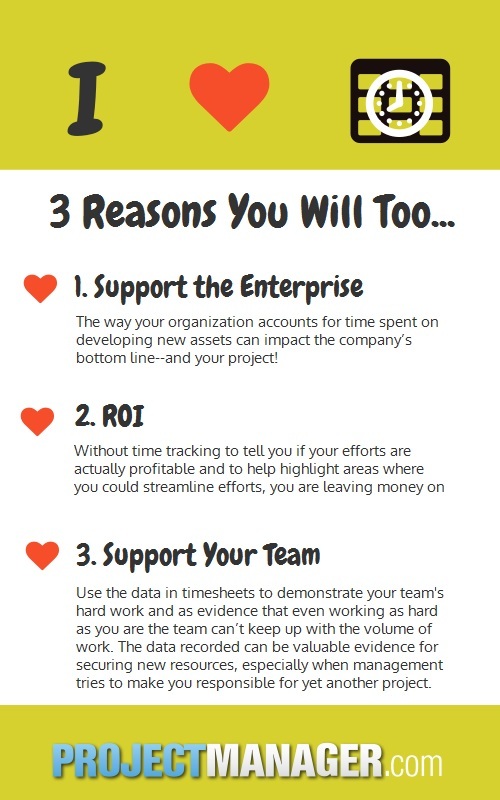 Project managers need to be conscious of the enterprise-level benefits of time tracking. The way your organization accounts for time spent on developing new assets can impact the company’s bottom line. The benefits of time tracking go way beyond being able to estimate more effectively based on historical data. Accurate timesheets can impact the balance sheet. Most organizations are in business to make money, even if that money is then ploughed back into charitable endeavors or a not-for-profit. Without time tracking to tell you if your efforts are actually profitable and to help highlight areas where you could streamline efforts, you are leaving money on the table. Struggling to hit all your deadlines? Don’t let management beat you up about it: you can use the data in timesheets to demonstrate that even working as hard as you are the team can’t keep up with the volume of work. The data recorded can be valuable evidence for securing new resources, especially when management tries to make you responsible for yet another project. Time tracking isn’t the most exciting part of managing teams, but it’s one of the most critical. It gives you and the team so much information with which to make better judgements. Timesheets are having a modern renaissance – yes, even in knowledge work! They support the modern work environment in ways that perhaps you haven’t thought of yet, so give time tracking a go and see what other benefits you achieve beyond what’s mentioned here. Take it further: Read our timesheets guide to learn more. Getting started easily requires software that supports your team to track their time and doesn’t get in their way. The integrated project management and time tracking features of ProjectManager.com is one of the reasons why our clients choose us. Try it for yourself with a free trial.